Kate Atkinson’s first new Jackson Brodie novel for nine years will be published in June 2019! Big Sky is a brilliant new literary crime novel from award-winning, number one bestseller Kate Atkinson. Jackson Brodie, ex-army, ex-Cambridge Constabulary, currently working as a private investigator, makes a highly anticipated return, nine years after Started Early, Took My Dog. Jackson Brodie is a private investigator, originally from Yorkshire. A former soldier and policeman he now makes his money working from investigating infidelity and finding missing cats. Jackson’s tough-guy exterior belies a deeply empathetic heart. He’s unable to resist coming to the rescue and increasingly he becomes a magnet for the bereaved, the lost and the dysfunctional. His ability to connect comes from his own tragic childhood that still haunts him. Jackson Brodie was played by Jason Isaacs in the TV series Case Histories brought to BBC One by Ruby Films. Kate Atkinson won the Costa (formerly the Whitbread) Book of the Year prize with her first novel, Behind the Scenes at the Museum. 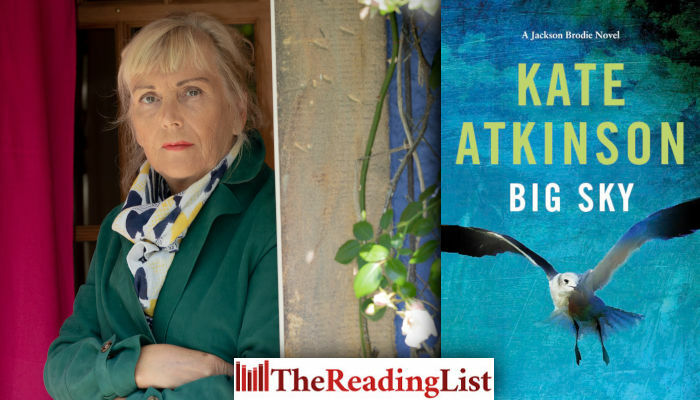 Her 2013 novel Life After Life spent a record number of weeks on top of the bestsellers lists on both sides of the Atlantic, and won the South Bank Sky Arts Literature Prize and the Costa Novel Award, a prize Kate Atkinson won again in 2015 for A God in Ruins. Her latest novel is Transcription.